Prince Harry and Meghan's life-size cake can feed 1,000 people. 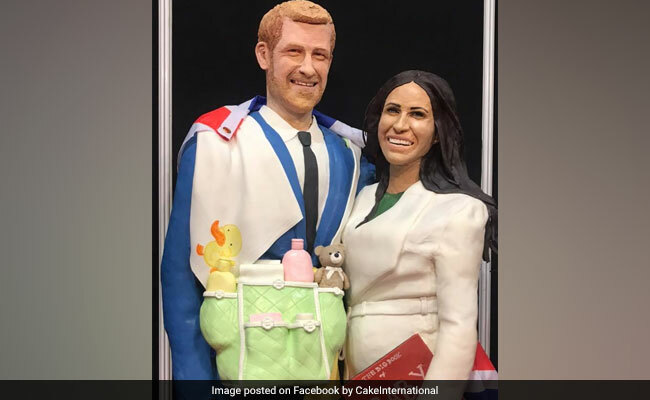 The Duke and Duchess of Sussex have been turned into life-sized sponge cakes, thanks to one talented British baker. Lara Mason from Brownhills spent over 250 hours creating a beautiful cake in the likeness of Prince Harry and Meghan. In a nod to the soon-to-be-parents, her beautiful cake shows them holding a baby bag and a baby book. "With added baby bump and all the necessities that come with having a little one," wrote Ms Mason on Facebook, sharing a picture of her massive cake. According to the Mirror, the 6.5-foot tall Harry and Meghan cake was baked using 300 eggs and 50kg of fondant icing. Everything used in the cake, except its frame, is edible. The cake, which can feed 1,000 people, was put on display at Cake International, a baking festival where it received a lot of praise and appreciation from spectators. "Haha love the new baby gear on this cake," wrote one user on Facebook. "Amazing," said another. This is not the first time that Ms Mason has created a life-sized Harry and Meghan cake. Back in May, just before their wedding, she had baked another life-sized cake of the couple which had gone viral on social media.